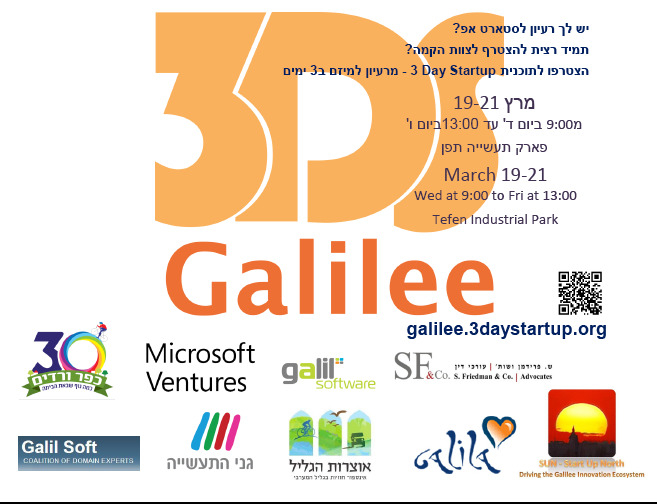 Galilee 3 Day Startup (3DS) is an experiential entrepreneurial conference with 40 participants coming together for three days to brainstorm, form teams around the top ideas, hack a prototype, formulate a business plan, and ultimately pitch to and gain feedback from a panel of top industry experts. The goal is to accomplish three months worth of progress in three days, to build relationships with potential co-founders/mentors/investors, and to found companies that will continue long after the program. The event is being hosted in the Galilee because we believe in growing the entrepreneurial community in this part of the country.